A few weeks ago I was thwarted in my plan to make Magnus Nilsson’s crispy lichen dish by my lack of a cured egg yolk. This weekend, it’s all come together: the egg yolks have had about a month to mature, and a walk on the North Downs produced a small bagful of beautiful grey-green fallen lichens. 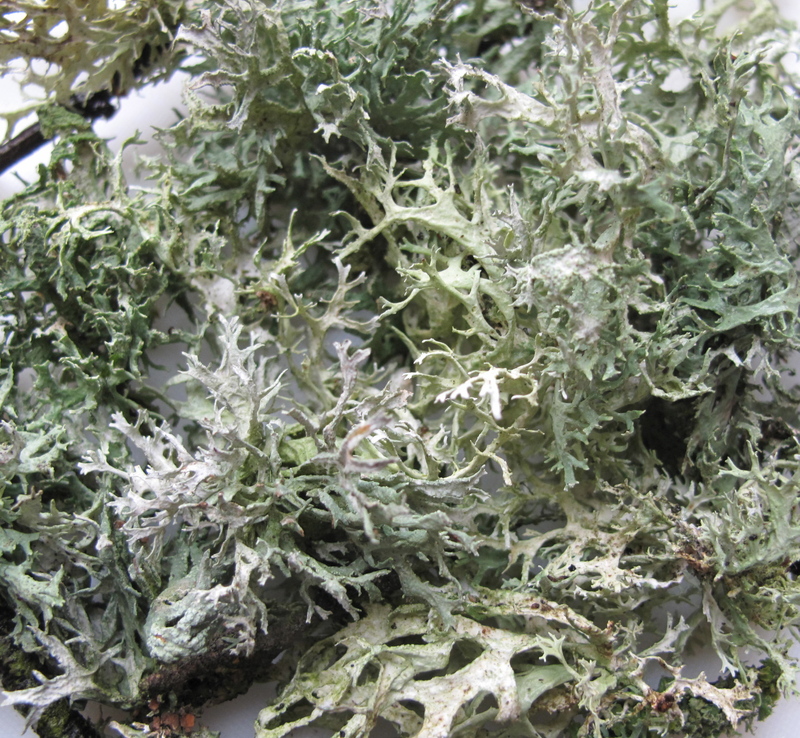 With the help of a fabulous leaflet from the British Lichen Society I identified my collection – mostly oakmoss (Evernia prunastri), and Flavoparnelia caperata, with a tiny bit of Ramalina farinacea – and then frightened myself out of eating most of it by researching each one in detail. But in the end, I took my courage in both hands and decided to go for it with the oakmoss. If I dare to eat Amanita muscaria after boiling in copious amounts of fresh water, as advised by David Arora and William Rubel (see this article), surely I could deal with a tiny portion of this lichen? I’m glad I did. Not only did I live to tell the tale, but as it cooked the lichen was fragrant, and when it was served it was delicious. Of course, you could say that almost anything that has been expertly deep fried, sprinkled with extreme umami flavour and dipped in lightly garlicky sour cream simply has to be good. I would be forced to agree with you. This treatment would work brilliantly with herb leaves or cabbage (à la Chinese restaurant seaweed substitute) – or even seaweed. I’m not sure I’ll feel the need to whip up a round of lichen crisps on a regular basis. But I have to admit that it was just a little bit of a thrill to try something completely new. adapted from Fäviken, by Magnus Nilsson, p. 202. I do not have access to either of the lichens recommended in the recipe, and so substituted a lichen commonly found in my region: oakmoss, Evernia prunastri. PLEASE exercise extreme caution when consuming wild foods that you have collected – and remember that you do so entirely at your own risk. Most lichens contain varying amounts of indigestible polysaccharides and lichenic acids which may be toxic in large quantities, so conduct very, very careful research to identify and decide on the safety of any you collect (really, this goes for all foraged foods). An excellent site from the University of Victoria contains really good descriptive detail on human uses of lichens: click here to visit it. I found it extremely helpful. But if in any doubt, it is always best to err on the side of caution and say no. Heat two large pans of water to a boil. Heat the oil ready for deep frying in another pan. When the boiling time is up, drain quickly and use tongs to immediately drop them into the hot oil – be careful, they will spit. As soon as they stop bubbling, remove from the oil and drain on paper towels, changing the paper frequently to soak up as much oil as possible. Whip the cream to soft peaks and season very lightly with the garlic. Put on in a small dish at room temperature ready to serve. Place the lichens on a hot stone, 2 per person, seasoning one with grated dried fish, and the other with grated cured egg yolk. 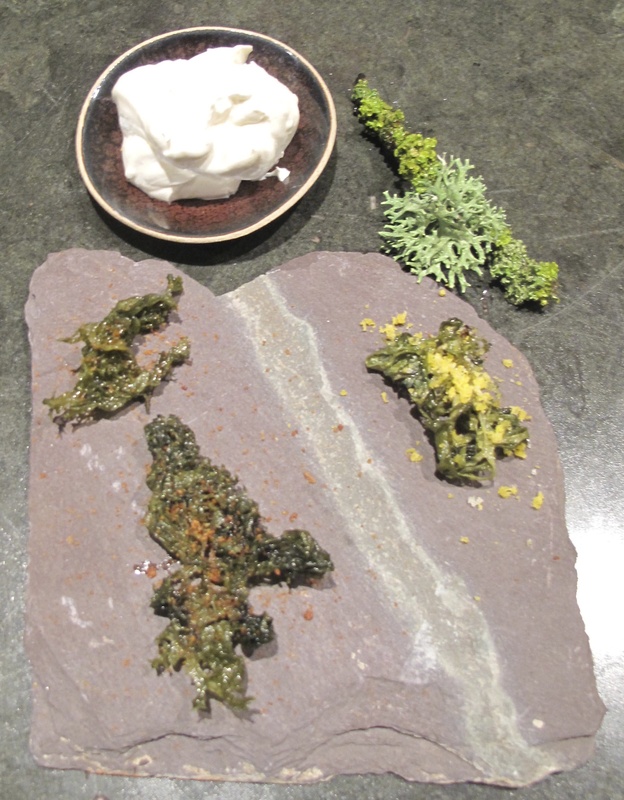 Serve with the cream, dipping each lichen ‘crisp’ or ‘chip’ in the cream before eating. *Bottarga is the pressed and salt-cured roe of grey mullet or tuna. Previous Post How many grains make a good porridge?